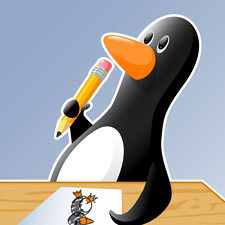 Penguins With Pencils: See you in the new year! I have been working 20 hour days all week with very little sleep, hence the lack of posts. But I promise to do some sketching over the holiday break and bring back some fun. Colorado is getting whacked with snow, and I can't wait to hit the slopes with my brand new snowboard! Can't wait to see the new stuff :) Have fun on the slopes! Hurrah! Have fun! See you soon! Tony Canepa is an artist and graphic designer currently working as a Creative Director in the professional sports industry. All items copyright Tony Canepa and are not to be used without permission. Awesome Inc. theme. Theme images by rajareddychadive. Powered by Blogger.